Andrew LeClerc knew something was wrong when he heard voices when no one else was around. Some were those of people he knew, others were unfamiliar, but all had the authentic mannerisms of real people, not his imagination. He was in his early twenties, unsure of his direction in life, and had been taking synthetic marijuana to ease stress from past traumas. Disturbed by the voices, he sought help in an emergency room and voluntarily admitted himself to a psychiatric hospital, not realizing he would be kept there for six days. He was diagnosed with psychosis, but had little interaction with a therapist. “You mostly sit around with coloring books,” he says. It felt like a punishment, when all he wanted was help. Eventually he was diagnosed with schizophrenia. Now, about four years later, at 26, LeClerc is learning to live with the condition. “It’s hard for a person who’s diagnosed with schizophrenia to be told something’s not real when they think it’s real,” he says. He continues to take antipsychotic medications that help control his hallucinations and lives in an apartment below his parents in Middleton, Massachusetts. 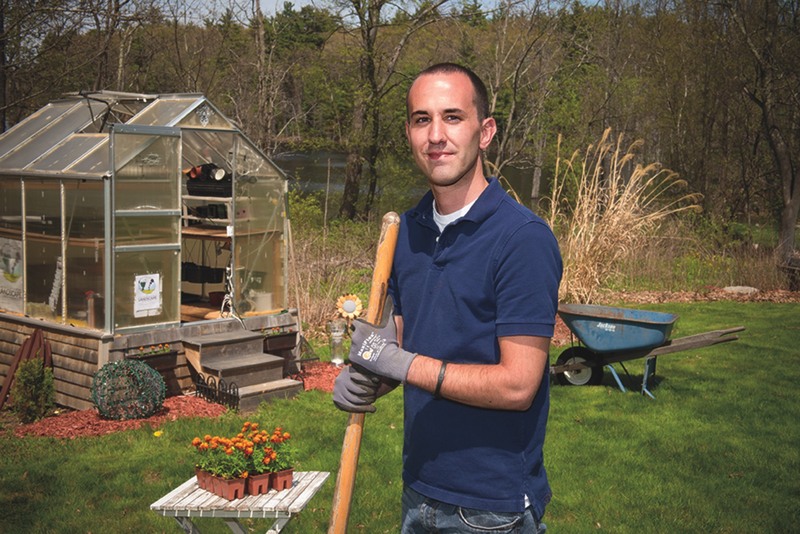 He’s hoping to start a small business, putting his love of gardening to work as a landscaper. But more importantly, he’s learned to make peace with his mind. He likes to say: “I don’t hear voices, I hear my own brain.” When voices do appear, he recognizes them as a product of an aberrant auditory cortex, and he thinks about engaging his prefrontal cortex—the decision-making part of the brain—to help him distinguish fact from fiction. “I have tools to pull myself back to the moment,” he says. Not everyone who struggles with schizophrenia is able to find such stability. The illness takes many forms; symptoms may include hallucinations and delusions, lack of motivation, and cognitive problems similar to dementia. It tends to strike in the late teens and early twenties, robbing young people of their mental stability just as they’re entering adulthood, beginning careers, or pursuing a college degree. Some improve, while others experience a long mental decline. But those causes are still mysterious. What scientists do know is that schizophrenia tends to run in families. About 70 percent to 80 percent of a person’s risk of developing the illness, Keshavan says, can be explained by genetic factors. Recently, there’s been a surge of effort to capitalize on that fact. Advances in genetics have made it possible to search not only for clues about schizophrenia and other psychiatric illnesses hidden within thousands of human genomes—but also for potential new treatments. As a result, there’s been a renaissance in research on schizophrenia and other psychiatric disorders, and some cautious optimism. “It’s been possible to make real if still early progress in understanding what genes and molecules influence these illnesses,” says Steven McCarroll, Flier associate professor of biomedical science and genetics. At Harvard, the leading force is the Stanley Center for Psychiatric Disease Research at the Broad Institute, which is pouring new funding and resources into amassing data on the genetics of mental illness. When he left the position, Hyman was interested in researching psychiatric disease but didn’t see a rigorous path to do so; instead, he accepted a position as Harvard’s provost—taking what he now refers to as a “10-year timeout.” During that time, a revolution occurred. Genetic technologies and vastly expanded computer power opened new paths for studying the biological basis of complex diseases. The Broad Institute launched the Stanley Center in 2007 under inaugural director Edward Scolnick, thanks to an initial $100 million in private funding from philanthropists Ted and Vada Stanley, aiming to bring much-needed innovation to treatments for psychiatric disease by harnessing the power of genomics. (The Stanleys provided another $650 million in 2014, an unprecedented gift for psychiatric research.) Partly as a result, the center has gathered the world’s largest collection of DNA samples for studying not only psychiatric diseases—including schizophrenia, autism, ADHD, and bipolar disorder—but also healthy control subjects. The resulting data are freely available to the public. Much of the research on genetics and disease has focused on what McCarroll calls “ ‘genetic sledgehammers’—genes that when mutated would almost certainly make you sick.” But schizophrenia, like most common diseases, is genetically complex. The hereditary component of the disease may be a product of tens to hundreds of “genetic nudges,” variations that don’t cause disease by themselves, but together make people vulnerable to illness. Studying genetic nudges requires amassing large numbers of DNA samples to achieve the statistical power to find subtle variations that may contribute to disease, a project that’s taken enormous collaborative effort by many scientists and institutions around the world. The Psychiatric Genomics Consortium—the largest scientific collaboration involving psychiatric disease—formed in 2007 and comprises hundreds of investigators in 38 countries and nearly a million genetic samples. The Stanley Center has served as the hub for data sharing, aggregation, and analysis to further the consortium’s discoveries. One of the key tools for uncovering the genetic basis of disease is the “genome-wide association study” (GWAS)—a way of quickly sorting through the common variations in genomes to find those that are more common in people with a given trait or disease than in those without. Associate professor of medicine Mark Daly, who leads the analytic hub of the consortium, says that scientists originally thought such studies might uncover a handful or two of DNA variants that could be statistically correlated with schizophrenia. But rather than identifying a few standouts, the consortium’s Schizophrenia Working Group found a crowd of genetic associations, each contributing just a tiny amount of risk. A landmark paper published in 2014 in the journal Nature, led by Michael O’Donovan of Cardiff University, described 108 different locations in the genome that harbored variants associated with schizophrenia. GWAS studies can identify only stretches of DNA: like flags on a zoomed-out map of a city, they provide a neighborhood, not the exact address. “We know where the variants are, one of which is likely to be the causal variant, but can’t say for sure which one,” says assistant professor of medicine Ben Neale, who is developing methods to analyze genomic data. Another approach is to sift through genomes in finer-grained detail by directly reading each letter of the DNA sequence. Such work is time-consuming, but it can help uncover rare genetic differences that are linked to disease, many of which have a stronger effect than common variants. Work by the consortium has also analyzed areas of DNA that are deleted or duplicated, called “copy number variations.” People with schizophrenia tend to have more such variations overall, and the genes they affect can provide clues to the disease’s origins. But so far, the picture is still incomplete. The vast majority of genetic samples, for instance, come from people of European ancestry. “From a purely scientific point of view, it means we’re missing a large proportion of the world’s genetic diversity,” says Karesten Koenen, professor of psychiatric epidemiology at the Harvard T.H. Chan School of Public Health. Most of that diversity is in Africa: There is much more diversity in African genomes than in those of people from other parts of the world. Koenen is leading an effort through the Stanley Center to launch genetic research on psychiatric disease in Ethiopia, Uganda, Kenya, and South Africa. Their researchers are partnering with researchers and academic and clinical institutions in those countries and will be gathering DNA samples and clinical information from people diagnosed with schizophrenia. “We really want to build local capacity,” she says, and develop sustainable research programs that can be led by local scientists and clinicians. The center also plans to extend the effort to Latin America, beginning in Mexico. What will all this data amount to? There’s a misconception, McCarroll says, that the goal of this research is to conjure up a “crystal ball genetic test” that will give people personalized treatments based on their unique portfolio of genes. That’s not the aim. “Our goal,” he says, “is to understand the core biological processes in the illnesses, so that innovative treatments can be developed that can treat anyone.” Scientists hope that the dizzying array of schizophrenia-related genes will converge onto a few basic processes in the brain, once the function of those genes is understood. Researchers from Harvard and the Broad Institute have grown human brain organoids, three-dimensional organ models cultured from stem cells, to study the genetics of psychiatric illness. This series shows (clockwise from upper left) growth at 1, 3, 6, and 9 months, with development of synapses indicated in green. Sekar, McCarroll, and Stevens also worked with professor of pediatrics Michael Carroll, who had developed mice with varying copies of the C4 gene, and showed that too much C4 activity in the animals can lead to excess pruning. “It’s too much of a good thing,” Stevens says. Their finding suggests that schizophrenia, in some cases, may be caused by loss of synapses in adolescence—an especially promising result because it supports clinical observations: synaptic pruning coincides with the age when schizophrenia typically emerges, and brain imaging shows that many people with schizophrenia experience a thinning of the prefrontal cortex in the early stages of disease. The work on C4 offers an example of how genetics is beginning to help neuroscience move forward. “It’s opened up a ton of new directions and strategies for our group,” says Stevens. Across Harvard and the Stanley Center, a growing community is launching collaborative projects with the goal of taking psychiatric disease research into new territories. One priority is developing new models for teasing out the role of genes in the brain. Scientists have been able to study some behaviors that relate to mental illness in animals, but there is no animal model for schizophrenia. Michael Carroll is now working to extend the C4 study by creating “humanized” mice that carry human C4 genes, which may make it possible to study their function in a living brain. But there’s very little that can be learned about psychiatric disease from isolated cells: brain activity depends on the constant chatter of many cells that are intricately connected. Arlotta has been investigating whether neural stem cells can be spun into something that behaves more like human brain tissue. So-called organoids—clusters of millions of cells up to a few millimeters in diameter—can be formed from growing stem cells in a nutrient-rich solution. Organoids have already been used to study events that happen in early development: last year, a team of researchers used them to study the effects of the Zika virus on developing brains. To better characterize these cell-based models, Arlotta and her colleague Kevin Eggan, a fellow professor of stem cell and regenerative biology, are collaborating with McCarroll to apply a technology his lab developed—DropSeq—that makes it possible to analyze gene activity in individual cells. The technology will provide a detailed, cell-by-cell understanding of what these models may reveal. In a Nature paper published in April, Arlotta’s team demonstrated that it’s possible to cultivate human brain organoids for nine months or more. Analysis revealed that the organoids are filled with a diverse mix of brain-cell types, and that these cells actually form interconnected networks, suggesting they may begin to function in ways that brains do. Some scientists and clinicians believe that gathering genetic data and studying cells is a misguided strategy for alleviating psychiatric illness. They see it as reductionist, and argue that it emphasizes the inborn biological origins of illnesses rather than other factors—like abuse, trauma, drug use, and emotional stress—that are known to play a role in their development. Hyman answers, “Genes are not fate, but genes have an awful lot to say.” Genetics and the environment both undoubtedly contribute to disease, but both ultimately must act on the brain—and genetics happens to be a more tractable way to study what’s happening in the brain. Genetics is already providing insights that could help alter the way psychiatric disorders are defined. “People have studied disorders with a box around them,” says Elise Robinson, assistant professor of epidemiology, who has analyzed genetic differences within and between disorders such as schizophrenia, bipolar disorder, depression, and autism, which are usually defined by clinical categories outlined in the Diagnostic and Statistical Manual of Mental Disorders. But Robinson says the idea of distinct boundaries separating these disorders is not necessarily consistent with biology. Genetically, psychiatric disorders look more like Venn diagrams with large overlaps. People with schizophrenia share 60 percent to 70 percent of genome-wide variation with those who suffer bipolar disorder, and about 25 percent with autism. Similarly, there is no simple dividing line between people who have a psychiatric illness and those who don’t. “Genetic risk for schizophrenia is not something you either have or don’t have,” she says. “There’s a little bit of risk in all of us.” Natural variations in many different genes, she explains, have been shown to relate to the way people perform on tests of cognitive or emotional skills. Schizophrenia may emerge from some combination of factors that are part of normal variation in the development and functioning of the human brain. This is true for other complex diseases and many normal traits, she adds: height, for instance, is largely determined by genetics, but there’s no single gene—or even handful of genes—that controls it. It’s a quality that emerges from many genetic inputs. Contributing editor Courtney Humphries is a freelance science writer in Boston and a recent Knight Science Journalism fellow at MIT.